Derbyshire is a county with magnificent natural beauty which provides a beautiful setting in which to enjoy a cycling break or a walking holiday. Explore Derbyshire's stunning rolling hills, rugged peaks, canal towpaths and gentle greenways by bike, or on foot. There are footpaths, disused railway lines and sweeping country roads locked away from the heavy traffic and the hustle and bustle of everyday life. Armed with an OS map the possibilities for walking in the Peak are limitless and so all you need is a sturdy pair of walking boots and let your feet take you across hills and dales in all directions. If you would like to get some inspiration then take a look at these popular walking routes. Whether it’s a family daytrip, a bicycle ride for two or some serious off-road mountain biking, then Derbyshire certainly is the place to do it. Cycling makes a great holiday activity, and if you haven't got bikes you can hire bikes at one of Derbyshire's cycle hire centres. New routes are being created every year to suit the pace of all abilities of riders, with more and more links directly into communities and to places of interest. 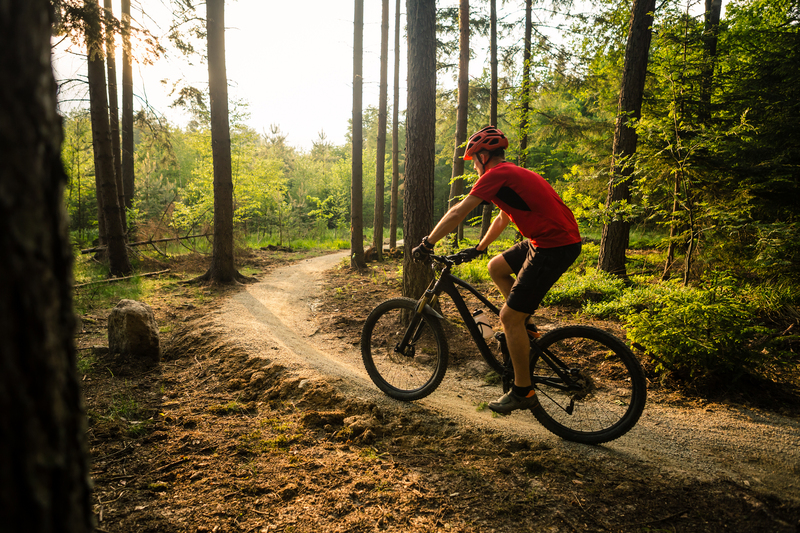 Cycling attractions include the splendid Trans Pennine Trail and the Pennine Bridleway both of which contain miles of traffic free cycle tracks giving wonderful views of the beautiful Peak District National Park . Many of the routes below cover these two trails and other cycling attractions in the county. Together with the High Peak Trail, this is the oldest of the Peak District Trails. It runs 13 miles from what was Ashbourne Station to join the High Peak Trail at Parsley Hay. This is a very pleasant ride, the surface is limestone so will be good in all weathers. The northern half runs over the limestone uplands, the remainder being the through softer lines of the lower valleys where the trail is largely wooded, giving occasional glimpses of the landscape. This trail is uphill all the way North, so it is a good idea to head North first. The High Peak Trail joins up with the Tissington Trail at Parsley Hay. It is 17.5 miles long and follows the old Cromford Railway, starting at Cromford and finishing at Dowlow, south of Buxton. This is perhaps the most interesting of the trails because this old railway line is much less straight than other railways, with sharp curves which seem to give frequent changes of view. For a railway line it is, in fact, not level and has several fairly steep inclines, which now provide variety for the cyclist. There are some steep inclines which may seem fun, however cyclists are not advised to ride on them. The Manifold Trail, located entirely within Staffordshire, runs for a total of 9 miles. It meanders through two river valleys; the Manifold and the Hamps. The section of the Manifold Valley through which this track runs is quite a good example of the deep limestone valleys of the White Peak. It is quite wooded so the views are not as spectacular as other trails. The most notable feature is Thor's Cave. N.B. The section between Wettonmill and Swainsley is open to vehicles, so you will need to keep close to any accompanying children and dogs. The Monsal Trail runs for 8.5 miles between Blackwell and Monsal Head. The Monsal Trail follows the deep limestone valley of the River Wye with crags towering 100 metres above, a river that changes from a fast flowing torrent to a serene lakeland paradise, and spanned by the Monsal Viaduct. Recently opened tunnels along this trail make it one of the very best that you'll find in the Peak National Park. The Longdendale Trail runs for around 6.5 miles, from just beyond Hadfield Station to the entrance to the Woodhead Tunnel. Following the Trans-Pennine railway closed in 1981. This is an excellent trail, especially for families and beginners. The surface is of smooth sand, which can make the going quite difficult when it is wet. This is not really a trail to try in bad weather, as it is very open to the elements. It is advisable therefore to choose your direction of travel according to the wind direction. The Sett Valley Trail runs 2.5 miles. It runs from Hayfield Station to New Mills. The Sett Valley Trail is at first hard work with many gates and obstructions to negotiate. However, from Hayfield onwards it is quite very pleasant. Hayfield village is well worth a visit and if you want to see some of the unspoilt countryside, then walk from the car park near Bowden Bridge towards Kinderlow Edge past Tunstead Clough Farm. The Middlewood Way runs for a total of 11 miles, from Marple to Macclesfield. The Middlewood Way is provides the ideal opportunity for a quiet and enjoyable family outing. Picnic sites are situated at various points along the trail. The Middlewood Way also offers walkers a number of alternative routes and circular walks via the nearby Macclesfield Canal and Ladybrook Valley. Ashbourne Cycle Hire, Mapleton Lane, Ashbourne, Derbyshire. The handsome market town of Ashbourne provides the southern gateway to the Peak District and is handily placed at the beginning of the Tissington Trail, but it’s also useful for exploring other cycling routes in the southern Peak. Middleton Top - Middleton Top Countryside Centre, Middleton by Wirksworth, Derbyshire. At the south east corner of the Peak District near Wirksworth, Middleton Top cycle hire centre enjoys a great location on the High Peak Trail with plenty of lanes and bridleway options. Parsley Hay is a remote and scenic location eight miles south of Buxton that sits at the junction of the High Peak and Tissington Trails, so that it’s an excellent base from which to explore the central cycling routes of the Peak District. Manifold Track Cycle Hire Centre - Old Station Car Park, Earlsway, Waterhouses, Staffs. The hire centre is housed in the old station building beside the public car park at Waterhouses, off the A523 Leek-Ashbourne road. A wide range of mountain bikes and attachments for adults and children are available for hire. Cycle parts and accessories for sale, plus repair facility for private bikes. Brown End Farm Cycle Hire - Located on the Manifold Track at its southern conclusion at Waterhouses, Brown End Farm offers 3-hour and all day hire of mountain bikes, child bikes, child buggies and trailer bikes, plus a tandem. Prices include free helmets, repair kits and baskets. Carsington Water Visitor Centre, Ashbourne, Derbyshire. On the southern edge of the Peak District near Ashbourne, Carsington Water is an attractively-sited reservoir surrounded by woodland and rolling fields and offers a range of cycling, including a partly traffic-free route around the reservoir. Monsal Trail Bike Hire Hassop Station, Hassop, Bakewell, Derbyshire. Located on the Monsal Trail less than a mile from Bakewell, the former Hassop railway station is now a great base from where to explore the limestone dales of the White Peak and the Derwent Valley by bike. Bike Garage, High Peak Garden Centre, Hope Road, Bamford, Derbyshire. Located on the site of the High Peak Garden Centre on Hope Road (A6187) near Bamford, the Bike Garage is a small, independent bike shop and hire centre. It’s ideally placed to explore the lanes and bridleways of the Hope Valley as well as the traffic-free routes beside Ladybower Reservoir in the Upper Derwent Valley. Deborah and Martin Hofman, Wheeldon Trees Farm Holiday Cottages, Earl Sterndale, Buxton Derbyshire. Four top-of-the range Giant Twist Esprit Power W Electric Bikes to help you explore the hills, dales and moors of the Peak District National Park.